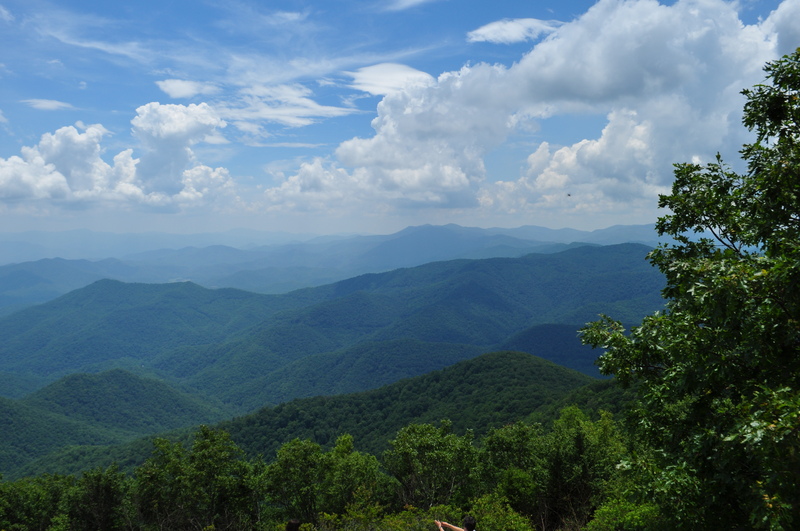 We have moved to the mountains of NC and arrived this past Saturday night. We are living with my parent temporarily until our house sells, so technically we still have to move one more time. The house is not on the market yet, but hopefully we’ll have it listed by July 1. We have some workers in to finish things we couldn’t do so that is what we are waiting on now. Aren’t these mountains just gorgeous? We’ve been driving around exploring the area and at every turn we see more beautiful scenery and are just in awe of God’s majestic handiwork. I have been able to set up a little sewing area in the downstairs bonus room at my parents house, and I’m so happy to be back to my sewing machine. We were apart for such a long time. I brought a large plastic bin of WIPs with me and my goal is to get them finished while we are here. And, if by some miracle I get them all finished, I have another large plastic bin of WIPs waiting for me in storage. And if they all get magically done, there is a smaller bin of WIPs. The amount of WIPs I have is staggering, but hopefully I’ll get many of them knocked out in the next several months. You may recall the lone star I started in January. This is the first WIP I plan to finish. I just picked it up this afternoon and am busy piecing each of the 8 panels together. It’s going together rather easily, so hopefully I’ll have a finished project to share with you in the next week or so. We’ll see. Usually the timing of my goals are a little unrealistic. And, I’ve picked up another hobby. I know, I know… I don’t have enough time to focus on the hobbies I do have, but I wanted to spend some quality time with my dad. He’s been taking painting lessons for several years from an art teacher in the area, so I thought that would be a good way for us to spend some time together. 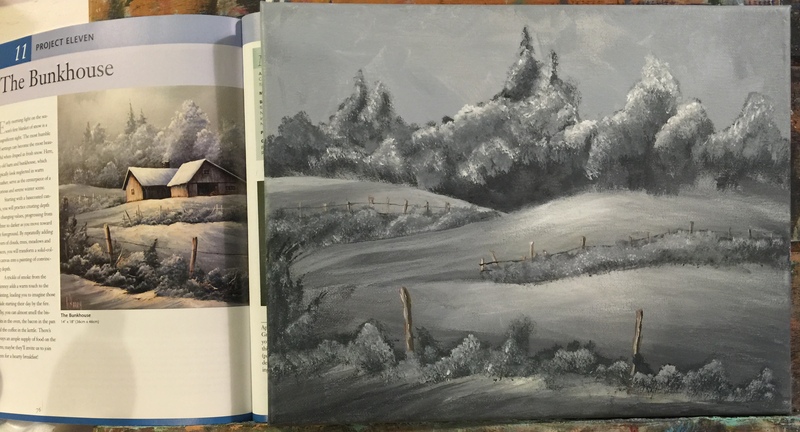 I’ve tried my hand at painting 3-4 times in the past 10 years or so and always enjoyed it, although it was never something I felt I could continue on my on. So I went yesterday with him to his painting class and started a landscape. It’s about 1/2 way finished, and I’m very pleased with it so far. Tomorrow afternoon we go again, and I hope to finish it then. Then I have plans for another painting that I plan to start next week. I’m really excited about it. So, I want to know… how many WIPs do you have? Please tell me that I’m not alone in having too many to count. I really haven’t counted, but if I had to guess, I would guess I have 30-40, and the true figure is probably even higher. Oh, that sounds just awful. LOL. What about you? 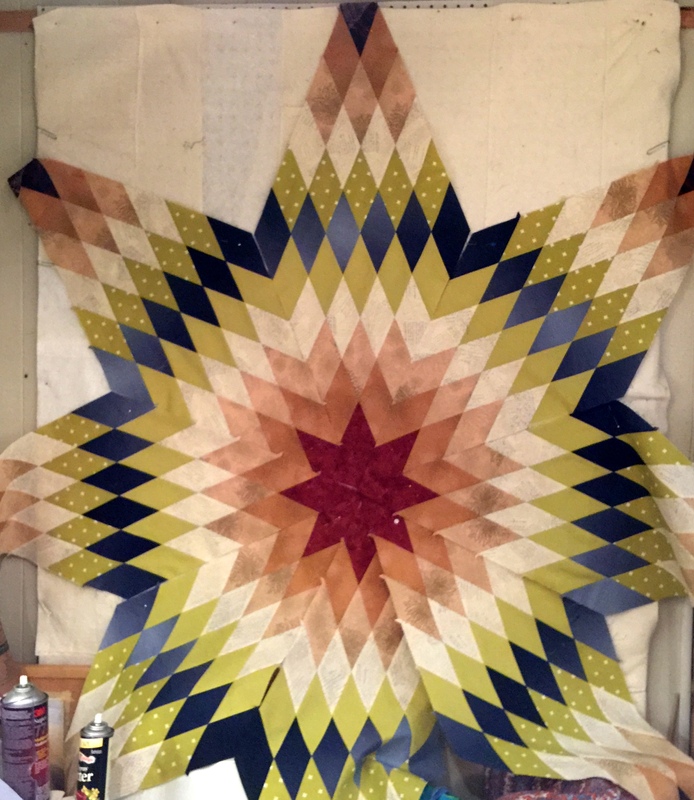 This entry was posted in Painting, Quilting/Sewing and tagged acrylic, landscape, lone star, painting, quilt, quilting, WIP by monkeyneedle. Bookmark the permalink. As always, I am amazed with your talent! Good to hear from you. Too many WIP to even discuss! Ha ha, I think we all have many WiP’s… I love jumping from project to project! I’ve just finished doing a bit of a makeover on my old Lone Star, yours is looking well on the way to nearly finished! Linda, I’m right there with you. I get bored with the same project, so I have to jump from project to project to keep interested. But I do love a finished project too!